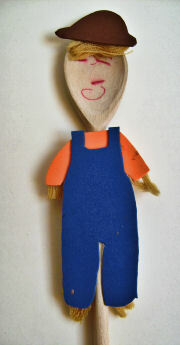 Dress yourself up a scarecrow puppet from a wooden spoon and a few fabric scraps, and he will be a great addition to your puppet show! This makes a fun craft to do with kids during the autumn / fall season. Cut out a hat, top and dungarees from the craft foam and glue them to the front of the spoon. Glue on some small pieces of yarn to the hat and where the hands and feet should be. Use your pens to draw on a face. Glittery suncatchers appeal to everyone - except perhaps the person who has to clean up the glitter! Before you make these glittery autumn leaves, put down a tablecloth or plenty of newspaper. Wait for the glue to dry for the magic to happen!